HAMILTON producer Jeffrey Seller announced that a new block of tickets for the Broadway production will be made available through Ticketmaster Verified Fan. Verified Fan is designed to separate actual, human fans, from bots and scalpers. The system aims to remove those who are in the business of taking away tickets from fans just so they can resell them. Once registration closes and registrants are reviewed, those selected receive an access code inviting them to shop for tickets, without racing against bots. The new block of tickets for HAMILTON on Broadway are for performances beginning August 21, 2018 through January 13, 2019. Tickets will go on sale Monday, January 15 at 10AM ET. Registration for the HAMILTON Verified Fan Presale is now closed. As we get ready for the presale, below are important details to know so you have the best opportunity to shop for tickets tomorrow. Login to your Ticketmaster account in advance on the device from which you intend to purchase tickets. NOTE: You must log in with the same email and password used for your Verified Fan Presale registration. Login to My Account to confirm your credit card is valid and reflects the correct billing information. Take the time now instead of rushing later – remember, your ticket purchase is on the clock. Once you select your tickets and continue to checkout, you may experience a longer than usual wait time. If this happens, do not refresh the page during this time. Don’t look like a bot! Do not use more than one browser window or device. Opening multiple windows or tabs to purchase tickets may result in errors, or even flag you as a scalper resulting in totally being blocked from buying. On your mobile? Don’t move away from your screen or allow it to dim. If you do not receive an access code or if you are unsuccessful securing tickets, the General Public Onsale will begin on Tuesday, January 16 at 10AM ET. How do I purchase tickets for the HAMILTON Verified Fan Presale? The Presale begins Monday, January 15 at 10AM ET. HAMILTON Verified Fan Presale tickets may only be purchased online, and we highly encourage you to complete your purchase using a desktop or laptop computer. For Accessible Seating, purchases may only be completed via the web, not your mobile app. To allow as many fans as possible to enjoy HAMILTON, there is an eight (8) ticket limit per order. Maximum aggregate ticket limit for performances 8/21/18 – 1/13/19 is eight (8) tickets. Due to demand, tickets will be available on a first-come, first-served basis. Click the link you were sent at the appropriate time. We highly encourage you to shop via desktop or laptop and transfer the link from your phone ahead of time. You’ll be directed to Ticketmaster to enter your access code and complete your ticket search and purchase. Due to demand, the Buy Tickets button may change to Limited Inventory or Almost Gone at any time. To begin your search, click the button to continue to Ticketmaster. However, when the inventory status is marked as Limited or Almost Gone, you may be unable to locate multiple seats grouped together or your desired price range. When should I expect my presale access code? If randomly selected, tomorrow morning, Monday, January 15, you will receive two text messages that include: a link to begin your purchase, and your unique access code. Keep your phone handy – your notification may arrive 2-4 hours before the presale begins. If there are any issues with text delivery, we will send an email with this information prior to tickets going on sale. I received an email with my invitation status, why am I on the waitlist and what does this mean? Due to extremely high demand for HAMILTON Verified Fan Presale tickets, we are unable to provide you an access code to shop during the presale. To ensure access to the presale is as fair as possible, the selection process to receive an access code to shop is randomized and is in no way influenced by purchase history or previous show attendance. However, we encourage you to have your phone nearby. Should ticket inventory become available, registrants will continue to be randomly selected to move off the waitlist, and provided an access code via text to shop for tickets. The presale has started, I registered and haven’t received an access code? Registering does not always guarantee you will receive an access code or have the ability to purchase tickets. On Sunday, January 14, we sent you an invitation status email. Please refer to this email for more information about your presale access and details. I registered for the last Verified Fan opportunity, shouldn’t I automatically get a code? Each Verified Fan opportunity is unique and you must register for each one separately. All registered fans who are verified will be equally eligible to receive an invitation for the Verified Fan Presale. However, if Verified Fan demand exceeds ticket supply, fans may be selected at random to participate in the Verified Fan Presale. There may be a couple reasons why your access code did not work. First, confirm you are signed into the same Ticketmaster that was selected for presale access. Next, confirm you have entered your access code exactly as it appears, case sensitive. As a reminder, there is an eight (8) ticket limit, if you have already completed a purchase, double-check you are not requesting a number of tickets that exceed this limit. How come I received a Verified Fan Presale code but can’t get tickets I want? We’ve seen massive interest for HAMILTON Verified Fan Presale tickets. When you begin your search, if the inventory status is marked as Limited Availability or Almost Gone, you may be unable to locate multiple seats grouped together or your desired price range. Tickets will be available on a first-come, first-served basis and are NOT guaranteed. I missed registration, will I still have a chance to get tickets? Yes. In addition to the Verified Fan Presale, there is a General Public Onsale on Tuesday, January 16 at 10AM ET and an access code will NOT be required to shop. How do I register for the HAMILTON Presale powered by Ticketmaster Verified Fan? Go to http://hamilton.tmverifiedfan.com and connect your Ticketmaster account to register. Or create a new account during registration. HAMILTON on Broadway is using Ticketmaster Verified Fan for the new block of tickets for performances beginning August 21, 2018 through January 13, 2019. In addition to the Verified Fan Presale, there will be a general public onsale that begins on Tuesday, January 16 at 10AM ET. If you are verified and randomly selected, you may shop for tickets during the Verified Fan Presale on Monday, January 15. In addition to the presale, there is a general public onsale that begins on Tuesday, January 16 at 10AM ET. Registration closes on Friday, January 12 at 6PM ET. Yes, you may register for the Verified Fan Presale from outside the U.S., just be sure to include your country code with your mobile number. While we suggest you begin shopping for tickets as soon as you can, we understand there may be some planning involved. You will have until Monday, January 15 at 11:59PM ET to shop for tickets during the Verified Fan Presale. As a reminder, due to demand, tickets are available on a first-come, first-served basis. You will only need to register once for this Verified Fan Presale. If selected, you will have the opportunity to select from any available performances beginning August 21, 2018 through January 13, 2019. Don’t worry, you will not be disqualified. We have successfully captured your registration and this is a confirmation of the details. Once we get closer to the presale, we’ll provide more information to the email used to complete your registration. Does registering mean I get an access code? No, registering does not guarantee you will receive an access code. The presale will begin on Monday, January 15 at 10AM ET for fans who receive an access code to shop during the presale. There is a strict eight (8) ticket limit per order. Maximum aggregate ticket limit for performances beginning August 21, 2018 through January 13, 2019 is eight (8) tickets. 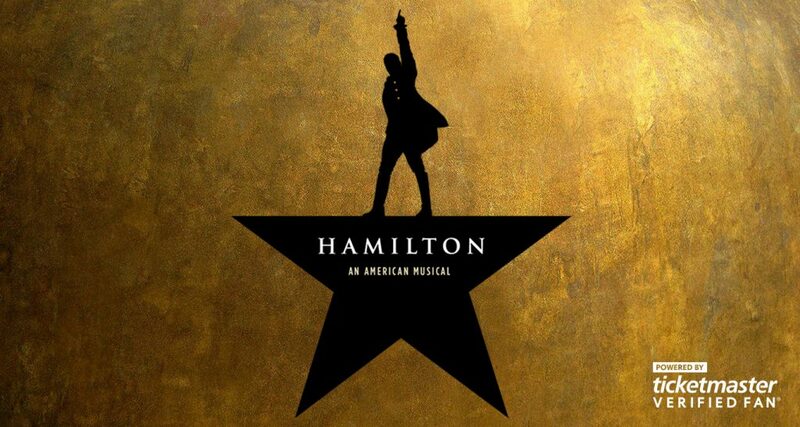 Please visit the HAMILTON Broadway Official Website for more information about ticket pricing. How do I learn more about show? Visit hamiltonbroadway.com follow @HamiltonMusical on Twitter and download the Official HAMILTON App.